This article is about the 2004 album. For the 2004 score for the same film, see Original Score from the Motion Picture The Punisher. 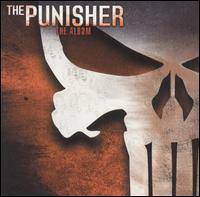 The Punisher: The Album is the official soundtrack for the film The Punisher and was released in 2004 by Wind-up Records. Its lead singles were "Broken" by Seether and Evanescence frontwoman Amy Lee, "Step Up" by Drowning Pool, and "Eyes Wired Shut" by Edgewater, all of which have accompanying music videos. The song "So Far Away" by Staind was featured in the trailer for The Punisher, but was not released on the soundtrack or featured in the film. ^ James Christopher Monger (2004-05-20). "The Punisher Original Soundtrack". AllMusic. ^ Spence D. (2004-04-15). "The Punisher: The Album". IGN. ^ Superhero Hype (2004-02-24). "The Punisher Album Track List Revealed". Superhero Hype. Retrieved 2011-11-22.